The Answer is: No Deal! Way to lead on this one, Senator McCain. Fact is, those House Republicans, well, lots of Republicans don't really like John McCain that much. You won't hear it from Rush and Sean Hannity these days, but they don't like him, either, and they used to speak of him with disgust. Will the House Republicans stand on principle or for principal? I don't like a bailout, I'm more of a free-market guy, but there comes a time when concessions must be made to save the whole system. I think Bush made a good case for this in his speech. 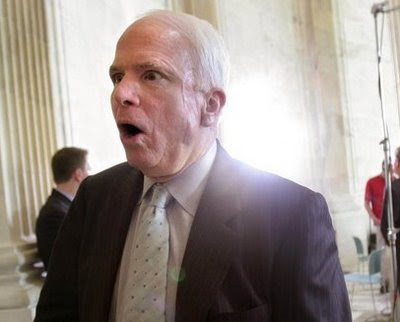 What's McCain gonna do? Does he have any power with House Republicans? This is gonna be a big day. Hang in there, folks! 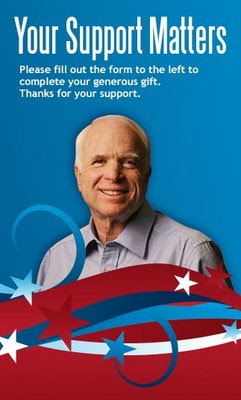 My friends, John McCain has suspended his campaign, but he'll still take your $$ for his campaign. Here's a link to make a donation to the McCain campaign. It's active this morning, while his campaign is suspended. I'm not suggestion you donate, I just want to point out that he's only suspended the part of the campaign he wants to suspend. He'll still take your money! NEW YORK (CNN) – John McCain and Sarah Palin’s meeting with Bono was canceled Wednesday due to scheduling reasons, according to the campaign. Instead, McCain and Palin will chat with Bono by phone this afternoon about the ONE Campaign, the U2 front man’s initiative to raise awareness of AIDS and global poverty. 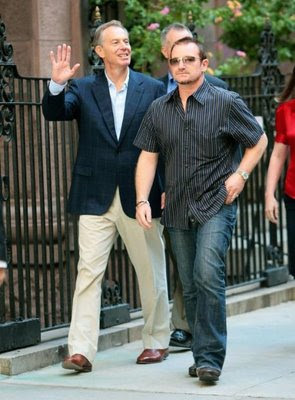 Unlike McCain and Palin’s other meetings with dignitaries in New York this week, most of which had been open to reporters and photographers, the Bono meeting was listed as closed to the press, at the rock star’s request. Then in the middle of the taping Dave got word that McCain was, in fact just down the street being interviewed by Katie Couric. Dave even cut over to the live video of the interview, and said, "Hey Senator, can I give you a ride home?" 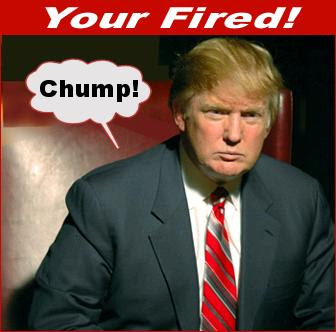 "He can't run the campaign because the economy is cratering? Fine, put in your second string quarterback, Sara Palin. Where is she?" No debate with Barack on Friday? Maybe he should just suspend his campaign altogether. I hear there's plenty of work for the poultry industry... ducking and being a chicken. Ya know, for that Palin-Bono meeting. Bono's keeping a blog this week, at the Financial Times. I'm really looking forward to seeing photos from this event. Obama advisers, for example, are considering how to provoke Sen. McCain into anger or showing what they say is how out of touch, or old, he is. Yeah, I'm sinking that low. This is one of those stories that just didn't get any MSM coverage. If McCain were running an honest campaign like he did in 2000, I wouldn't have mentioned it. Palin, the Alaska governor who Republican presidential nominee John McCain picked to be his running mate earlier this month, will meet with Iraqi President Jalal Talabani on Wednesday. She has meetings with Georgian President Mikheil Saakashvili, Ukrainian President Viktor Yushchenko, Pakistan President Asif Ali Zardari, and Indian Prime Minister Manmohan Singh on the same day. The appointments are in addition to meetings the campaign previously confirmed for Palin on Tuesday with Afghan President Hamid Karzai and Colombian President Alvaro Uribe as well as a sit-down with former US Secretary of State Henry Kissinger. 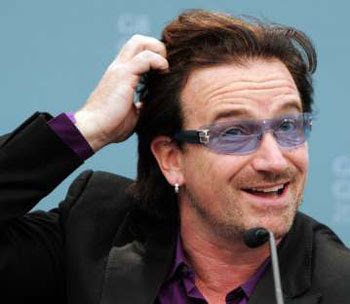 Palin will also meet with U2 lead singer and activist Bono on Wednesday. Well, maybe not your taxes. But certainly The Donald’s: Obama would repeal President Bush tax cuts for households making more than $250,000." In a July interview with CNN, Rothschild explained why, despite Clinton's calls for party unity, she couldn't back Obama. "I don't like him," she said. "I feel like he is an elitist."" With supporters like these, who needs enemies? "For several years now, American pundits have commented sadly on the alleged rise of anti-Americanism abroad. I am not aware of any such anti-Americanism. What has been growing is resentment of and opposition to certain, current U.S. government policies. America itself still stands tall in international eyes as a stronghold of democratic values and the ideals of individual liberty. All that remains is for informed citizens to stand up in November and call the country back to its roots." 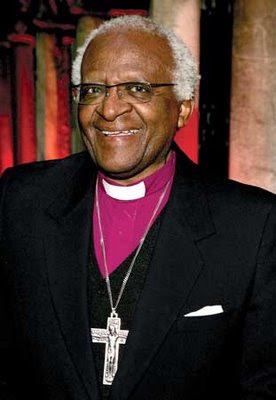 I wish more folks had his good nature. The article is rather long, but this is one of those stories that deserves more attention than the lipstick-laden pig. 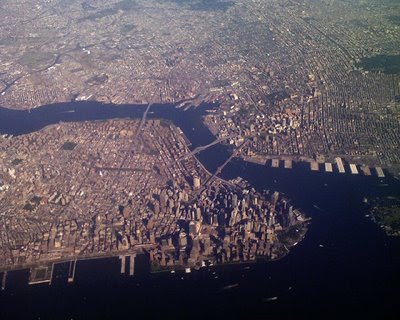 Flew over the WTC site this past weekend, still a hole 7 years later. A-hole. Reminds me we still don't have the bastards who planned and financed this dastardly deed, either. I'm still mad. I still want to get even, get justice for those poor innocent folks who died on 9/11. From Common Dreams: "Perhaps, we can introduce a system of merit pay for reporters and news producers in which their pay depends on their success in educating the public on key issues, just as many school districts make the pay of schoolteachers dependent on how well their students perform. Schoolteachers whose students perform badly don't get raises and could even get fired. Imagine that we applied the same standards to CBS, NBC, NPR and The Washington Post. If their audience couldn't answer basic questions about important public policy issues, then the reporters responsible get their pay cut. If the audiences are especially poorly informed, then the reporters get fired. Unfortunately, this sort of accountability in the media doesn't exist. Most political reporters sound like high school drama coaches as they spend their time talking about candidates' appearance and speaking mannerisms. They almost never bother to discuss the positions advocated by the candidates - that might require a few minutes of real work." If the MSM did this, news on TV would be worth watching!